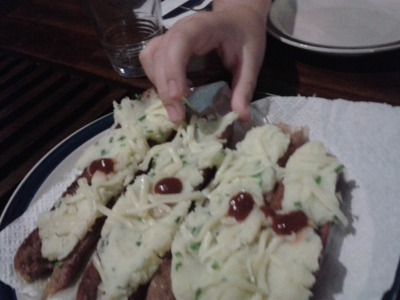 Growing up in NZ one of my favourite 'tea-room' meals was the greasy sausage with a sliver of mashed potato and, for some odd reason, a small dot of tomato sauce, so, as a change from bangers 'n mash I created my version of my old childhood favourite for the kids. Spread the potato mash on the sausage, sprinkle with cheese and add a dot of tomato sauce in the centre! Serve with favourite veges or salad for a dinner, or serve as a fun party snack using breakfast sausages!